Custom printed facial sprays and face spritzers are an excellent promotional gift or giveaway item that can be used to promote your business at trade shows and outdoor events. 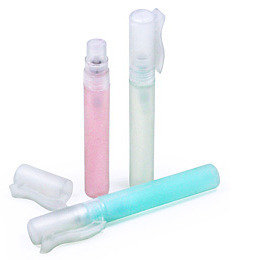 These promotional face mist sprays use a non-aerosol pump which is safer for the environment. This handy, pocket sized giveaway item is lightly scented with floral water to create a refreshing face and body spray that will help to tone and hydrate the skin. Contains approx 7ml. Transparent (frosted) base and cap.